I'm delighted to announce my newest STEM-related book, Zoobots, has just been released by Kids Can Press. It's a pretty exciting (if I do say so myself) survey of the latest developments in robotic research. Glorious, hyper-realistic illustrations by Australian Alex Ries are totally wow-worthy whether you're a transformer-transfixed kid or a formerly jaded grown-up. I'm just as happy to announce that the book has already been picked up by the Junior Library Guild, and nominated by Capitol Choices for its Noteworthy Books for Children and Teens list. If robotic animals fascinate you - and really, how can they not? - check out my Pinterest board, Cool Robots, where I've posted lots of links to articles about all kinds of amazing mechatronics. And don't forget to watch out for cockroach-bot overlords. They're on their way to a kitchen counter near you. It's been a busy week or so in the world of science - a lot to keep track of. Here's a quick guide for those who, like me, are feeling a bit overwhelmed. First, there's the Old: A couple of new dinosaurs have been identified. One of them is a miniature cousin of the best-known predatory dinosaur, T. rex. This little guy (well relatively little, but still way bigger than any of us) has been named Nanuqsaurus hoglundi - meaning, roughly, polar bear lizard - and he roamed the Arctic 70 million years ago. You can read more about him, and find some pictures, here and here. The other was found a few thousand kilometres south and east, in the states of North and South Dakota. It's a strange, half-birdlike creature that scientists have nicknamed "the chicken from Hell" - not because it's so scary, although its claws are impressive, but because it was found in a geological formation called Hell Creek. A little more formally, the chicken from Hell is Anzu wyliei, and you can learn more about it here. A handy-dandy non-scientist's guide to what all the excitement is about. A story about the impact of the discovery on the scientific world. And a delightful short video of one of the scientists who predicted this discovery learning that his prediction appears to have been confirmed. 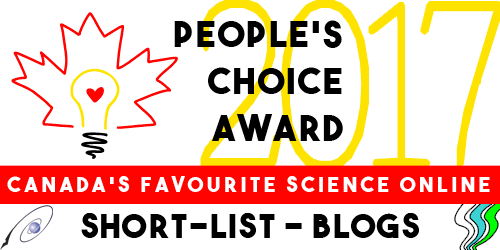 And that, fellow science fans, is the momentous week that was! Tall, flat stones arranged in circles stand straight, their limestone edges sharply sculpted. Some are six metres in height, and decorated with a menagerie of carvings: lions, gazelles, foxes, donkeys, bulls, reptiles, insects, and birds. The pillars are enclosed inside circular walls. There are four such enclosures, back to back, each surrounding up to eight pillars each. Sixteen more enclosures remain out of sight, under the earth. These 'rooms,' with their rings of standing stones, were buried at Gobekli Tepe (potbelly hill), a man-made mound 15 metres high, located in Southern Turkey. These awesome monuments were made without metal. They were sculpted with stone tools, and transported hundreds of feet from a quarry without beasts of burden or wheels. At the time they were built, writing had not yet been invented. Neither had pottery. Their discovery has changed the way archaeologists think about human civilization. 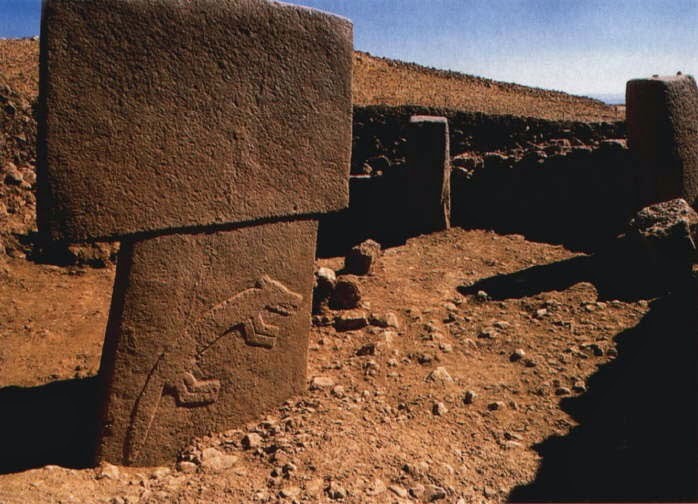 Gobekli Tepe rivals Stonehenge in its complexity, but predates it by some six thousand years, hailing to 9600 - 8800 BC. It is older than the pyramids and the ancient cities of Ur and Catalhӧyuk. It is the oldest known building project on Earth. 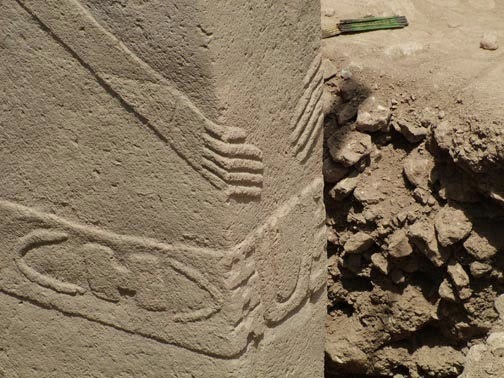 But it is not its age per se, its engineering, or even its artistry that make Gobekli Tepe so special. It is that the people who created and used it were nomadic hunter-gatherers living before the invention of agriculture. There is no local source of water, no traces of housing, cemeteries, domesticated animals or plants. The people who built this 'temple' did not live here, nor anywhere else permanently. 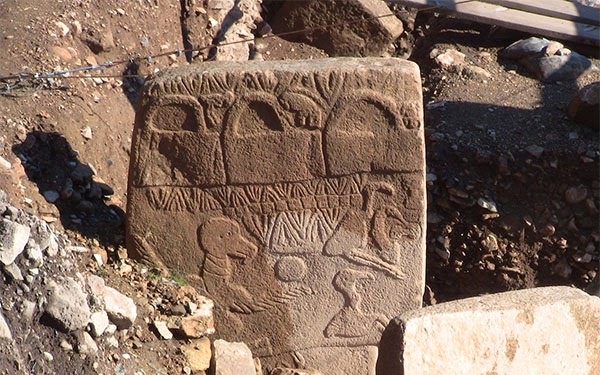 The existence of Gobekli Tepe turns the common understanding of the development of human civilization on its head. The old way of thinking has humans in Mesopotamia discovering that wild grains can be saved and planted, and wild animals captured and contained. 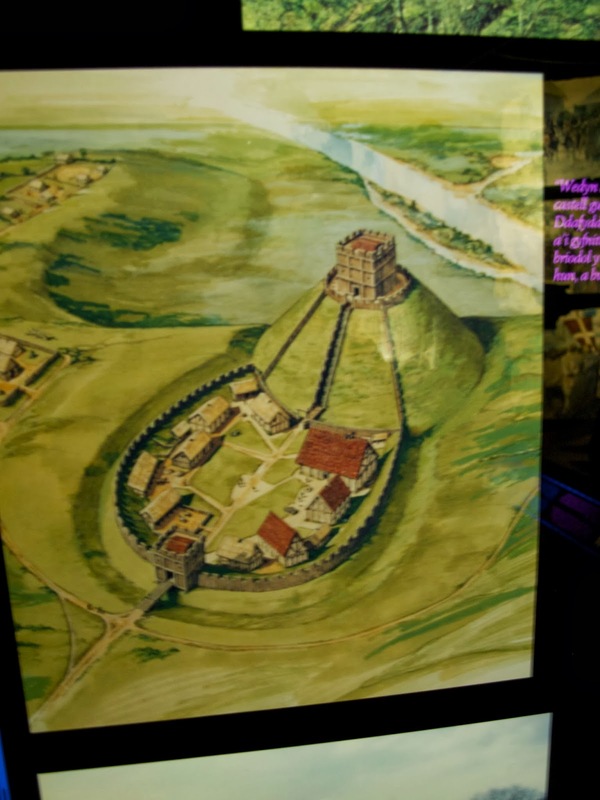 This ‘Neolithic revolution’ encouraged people to settle in one place, growing and keeping food instead of hunting and gathering it. Then, as a consequence of the new stability, came increased food supply, growth of community, cooperation, division of labour, extra time to devote to art and architecture, religion, organized cemeteries, public buildings, etc. Gobekli Tepe, however, was built by a number of people over a significant amount of time, organized, cooperating, and practicing a common religion -- all without the existence of stable, permanent settlements. Besides demonstrating that long-held beliefs can be wrong, and that early human societies were more complex than previously thought, Gobekli Tepe is a spectacular site in its own right. What people were doing here is still a mystery, and the lack of writing means there is no voice from the past to tell us what these structures meant to their culture. There are some intriguing clues, however. For one, some of the T-shaped stones have belts and arms carved on them, suggesting they are stylized representations of people. For another, what look like benches are built into the walls – for visitors to rest awhile, dead or alive, in the company of the stone statues. Some believe that Gobekli Tepe’s stone circles were sanctuaries to link the world of the living with the world of the dead. Today, they still function as a link to the world of the dead, the only connection we have to the culture that lived and died in that part of Turkey more than 11,000 years ago. The stones still tell stories of their builders, whispering secrets of our distant relatives. This one-day session shows ways to create your own games – science games, funny jokes, role-playing adventures – that you can use once, or play for years. Includes samples and a handout to get you inspired. Ask questions based on your own needs and goals as well as on the ideas presented. Paula Johanson has worked as a writer and editor for over twenty years, teaching writing workshops for community colleges, libraries, and recreation centers. As well as making games for her own family's use, Paula has written game materials for d20-compatible game publishers. People who like kayaking, canoeing, and stand-up paddleboarding are people who care about the environment. Kayaker Paula Johanson, writer for the blog KayakYak, will be visiting Langley Library to show us how to be Green Paddlers. Did you ever carry a kayak on a bus? Or a train? Or an airplane? Paula has. 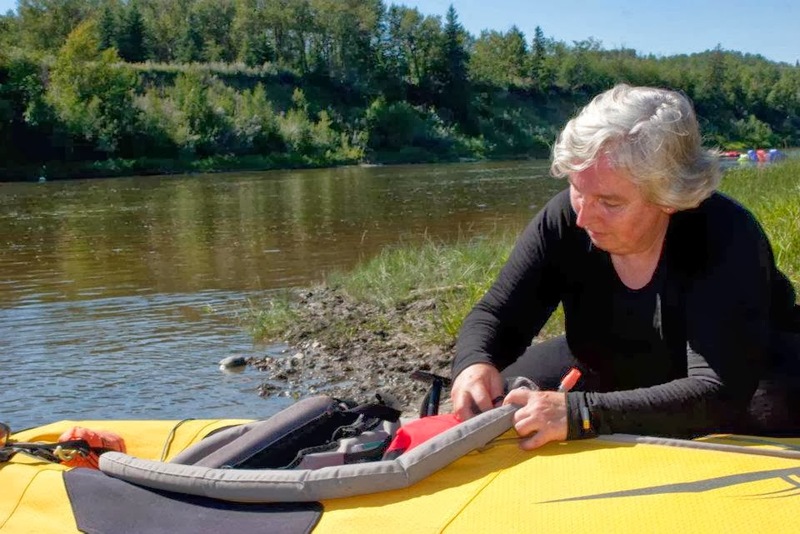 Come handle the folding inflatable kayak and gear used in the Gulf Islands, Ladysmith BC, Toronto Ontario, and the Red Deer River in Alberta. Join us and share ways to reduce your carbon footprint while getting out on the water. I love castle hopping, and Wales is one of the best places to explore ruins from bygone days. With some 400 castles in about 20,000 square kilometres (8,000 square miles), there's a lot to explore. Last year I had the chance to see Criccieth Castle, located at the top of a rocky hill overlooking Cardigan Bay, North Wales. According to the Cadw's Criccieth Castle guidebook, the earliest records of the castle date from the 1230s, when Llywelyn ab Iorwerth (Llywelyn the Great) made it a main seat of power in North Wales. He built the inner ward of the castle, including the twin towers, using a mix of angular stones from the rock around the castle, glacial boulders, with grey mortar made from beach gravel. The D-shaped towers are typical of Welsh native castles, but these twin gatehouses may have also been influenced by castles of the Marcher lords at Cheshire and Montgomery. The various princes and kings who owned and controlled Criccieth had a hand in adding to its architecture. Although determining the date of a castle ruin might seem straightforward, there is a controversy over who built what part of Criccieth. Experts turn to structural evidence in the ruins to develop their theories and time estimates. For example, Llywelyn ap Gruffudd (Llywelyn the Last) added an outer ward to the castle. The mortar used in his time is more gravelly, with stones and boulders brought to the site (rather than quarried from the castle rock) along with blue-grey slate. 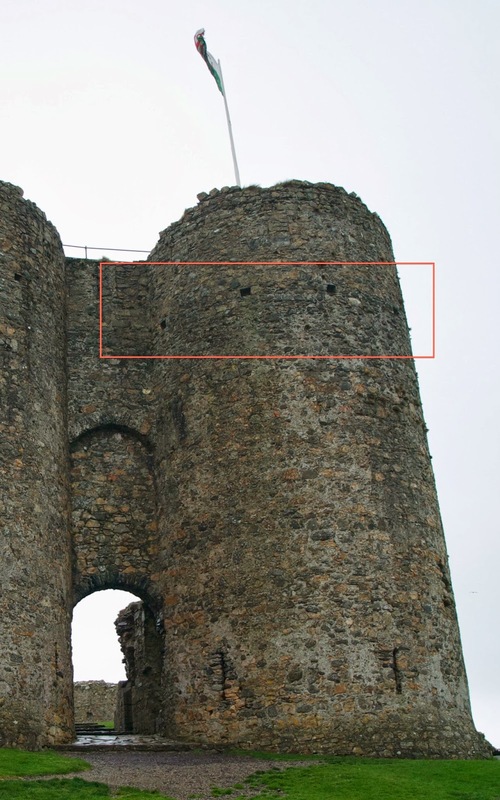 Experts believe the square holes about eight feet from the top mark the height of the towers during the time of the Welsh princes. 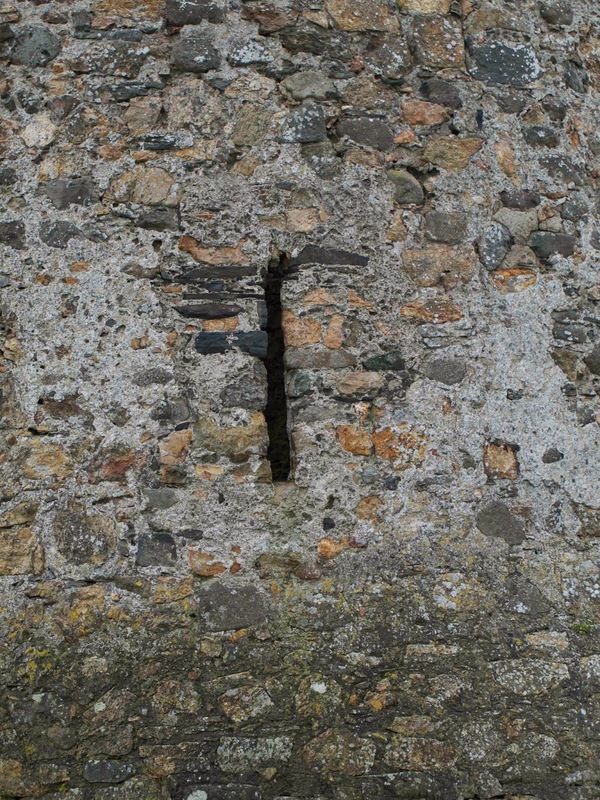 Arrow slits that can be seen at the ground level of the towers, as well as at strategic positions throughout the castle, offered a protected spot for archers guarding the castle from attack. Criccieth had several other buildings and towers as well, including one thought to have housed a trebuchet (a machine to throw stones) or a catapult for warding off enemy attacks. Criccieth fell to Kind Edward I of England in March 1283, and was later held by Edward II (1307-1327) as well. They built up the top of the towers to the height we see today. The square holes held horizontal beams for a fighting platform (or "hourd") projecting from the wall. The English also used castle rock again, but the mortar from this period contains more shells. Edward II spent over £250 on repairs and refurbishing, according to the guidebook. 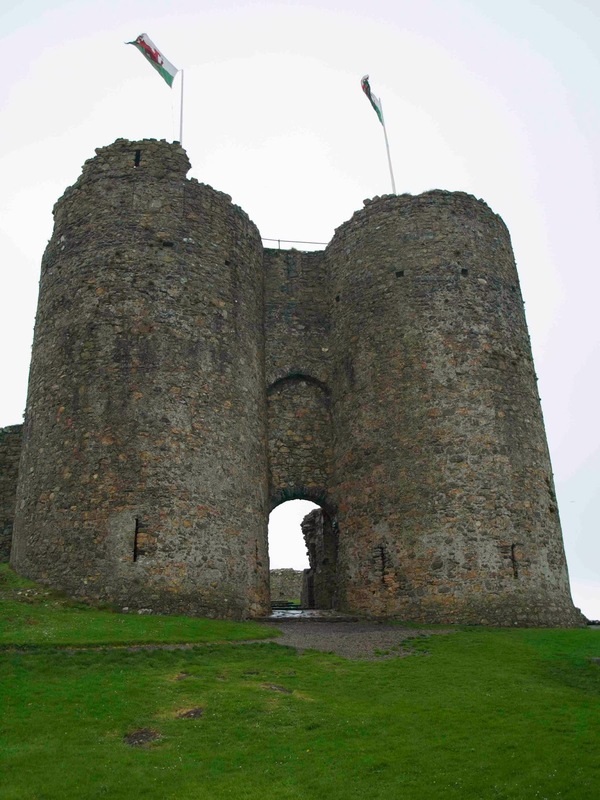 The castle was finally destroyed in about 1404, during the time of Owain Glyndwr, and was never rebuilt. A small museum and gift shop at Criccieth tells more of the history and architecture of the castle, with colourful floor plans such as this one. Another useful resource is the Castles of Wales website, which includes a discussion of the history, geography, architecture, and archaeology of this and other Welsh castles. As well as the guidebook, Welsh Castles by Adrian Pettifer also offers discussion of Criccieth and other castles by area. Marie Powell is the author of seven books for children, including Dragonflies are Amazing (Scholastic Canada) and a six-book Word Families series (Amicus Publishing). 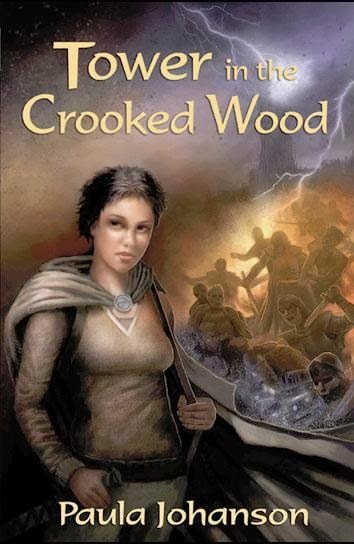 Her second six-book series is expected this fall.